Apart from the sound of scraping fingernails or broken chalk upon it, the worst thing about the old-style school blackboard was having to watch the flapping flabby undersides of Mrs Kaye’s arms as she put up times-tables and spelling lists. In the fifties, our teachers liked to go sleeveless, and it was never a good look, Mrs Whitworth and Miss Tinkler (yep) excepted. What was a good look back then was just about anything on wheels from Detroit-Windsor . Even the very old (so probably, er, 42? ), thin-lipped, flabby-armed, hopelessly square Mrs Kaye motored about in one of these honeys, a 1957 Olds 88. Pretty, pony-tailed Miss Tinkler preferred a Ford Customline for her 25 mile drive in from the hamlet of Starbuck. Apart from Miss Tinkler, her pony-tail and her Ford, Starbuck was notable only for being around about where my Dad’s Vauxhall ran out of gas annually on our way home from a Saskatchewan summer holiday. He insisted that with a light foot on the gas pedal and scant attention to the gearshift, that pile of British junk could make it home from Carlyle Lake on a single tank of gas. But for four years running, until he relented and bought American, albeit the most spartan, underpowered, single-carbed, chromeless, no-radio Chevy he could find, two or three miles either side of Starbuck was the limit. 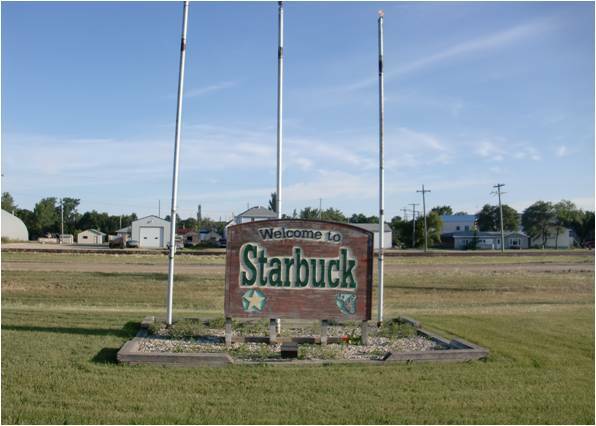 Never, of course, Starbuck itself. So big brother Cameron and I would push, Lord knows why, with our long-suffering mother at the wheel, while Daddy thumbed a ride to the Starbuck Texaco for a can of gas. After the switch to Chevy, there was no reason at all for Starbuck to exist, because Miss Tinkler had gone and married a city boy, and begun to go flabby in the arms. I just finally found the comment tab! Duh. I can so see your Dad doing this! I laugh while I read. Starbuck is so close and yet so far away when your tank is on empty.